Problem:- Write A C++ Program For Find The Gross Salary Of An Employee. Gross salary is different from Net, Salary gross salary calculated annual basis we can calculate a gross salary by using the following formula (Gross salary = Net Salary - Deduction. ). Deduction = Tax ( HRA. + DA. + MA. ). Formula's :- Gross Salary = Basic + Da + Hra + Ma. Deduction = Gross Salary - Pf - Pt - It. Net Salary = Gross Salary - Deduction. Logic:- For finding a gross salary of Employee we need to calculate DA and HRA then Sum Of Basic Salary + HRA + DA. after calculating the sum print the sum. 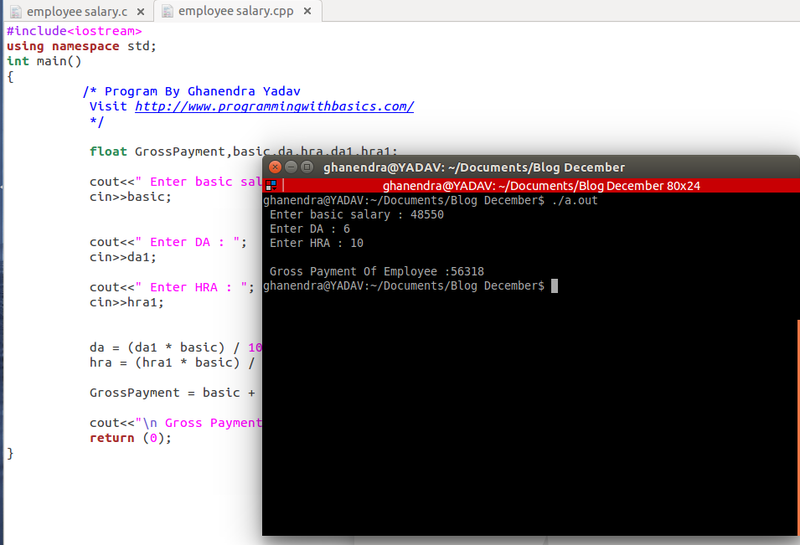 So basically first we calculate a DA, and HRA after that we add basic salary + HRA +DA so, in this way, we can find the Gross salary of an employee.